Bplus has just announced that their newest WiiWare title Niki - Rock 'n' Ball is set to hit the European WiiWare service this Friday, December 19th for a mere 500 Wii Points. After seeing video of the game in action, we're looking forward to taking the game for a spin once it's released. Below is the official press release for the game and the official Niki - Rock 'n' Ball site has also just launched that you can check out for even more details on the game. Bplus, independent software developer, today announces the launch of the official website to Niki – Rock 'n' Ball, its upcoming arcade platformer, available on WiiWare™ soon. What is a ZeLeLi pearl? How does the Amulet work? Where do all the monsters come from? This and more is revealed on the website together with an exclusive new video that illustrates the intriguing story of Niki - Rock 'n' Ball. The website offers many new screenshots as well as detailed information about how the game can be played and introduces not only the hero Niki but also the Turbofan, the Bumper and some of the monsters Niki has to fight in his first adventure. 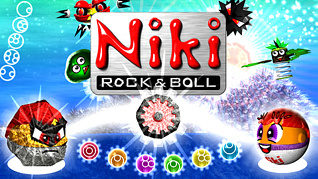 We'll have more information on Niki - Rock 'n' Ball as it becomes available, as well as a full review of the game once it hits the European WiiWare service this Friday. Okay, now that I've secured my first... I just have one thing to say. Can we trust BPlus? not really interested in this to be honest, something else to add to my growing list of games i dont want from wiware! Seriously, I'm excited for European gamers to finally get a chance to play World of Goo. I'm especially anxious to see the comments on it. @Corbie - It sure was. This game looks fairly stupid, but I won't judge it until I see a review or two. Wow 500 points, I love BPlus' work. I can't wait until it comes in NA! I knew this was coming out for a day or so now. Due to a previous post. Well its nice to know everything is official now. Hopefuly this game is better than Planttechen. Looks ehh to me, maybe if i have a left over 500 points. I have to give BPlus cred for trying different things with the remote. However, whatever it is they are doing with the Wii Remote tilting does not look comfortable. In fact, it's giving me horrible flashbacks to playing Mario with the Power Glove. The last game was marred partly by its controls. I hope BPlus doesn't make the same mistake twice! i'm very unsure. we could certainly use some more platforming type action. i'm wait for a reviews. and hopefully, the reviewer will consider this a separate game, and not the thoughts of platchen impact this game. This actually doesn't look terrible. The only thing that's still getting to me is the control. Couldn't they have just controlled the character by making the player hold the Wiimote like a steering wheel? I'm surprisingly interested in this one. It looks quite fun as it reminds me of some fun and simple C64 games Even that controlling system reminds me of playing games with a good old C64 joystick. And with only 500 points being the price, I think I'm going to buy it if it's going to have even remotely good review. I like Plattchen, and I believe I'm gonna like this one (the price helps), also I read it can be played with the crosspad too, if that's so Bplus got a buyer. Looks more like a tech demo to me. I don't even get what the point is in this game. And the controls don't look all that friendly either. I am quietly hopeful for this one. It's no secret that I hated the convoluted gameplay in Plattchen, but I have to say this does look like it might be quite good fun. I am glad Bplus have got the message about pricing now. At 500 points I expect this should sell nicely if the game doesn't stink somehow. Whilst I agree this one doesn't look terrible it doesn't look very exciting either. 6/10 at best I reckon and that's just because of the cheapo price point. 500 points sounds nice, however I hope it's better than the 500ers we had till now. At 500 points I expect this should sell nicely if the game doesn't stink somehow. Its released on Thursday not Friday. 11pm in England Thursday nights. And remember that we get three or four WiiWare games on our weeks. If this and Art Style have been confirmed, its still possible to get World of Goo. If its ready. This gameplay looks surprisingly simple and fun (although I can see how switching between the two ball types could get difficult at times). I'm actually looking forward to this one! Looking forward to this one actually, looks pretty fun. I'm looking forward to it - the website description is much less complicated to understand than PLATTCHEN's, though I can see myself opting for the retro controls. Maybe this will help make up for the lack of World of Goo. You just crossed the line, my friend. Wait... I was taken aback there for a second. I think, though, after much scrutiny that... WiiWare is getting a puzzle game! Who would have thought? Well, I can't tell what's going on, so I'll check the website. Anyway, I'm kind of tired of people blabbering about having another puzzler. World of Goo was a puzzle game, but it was brilliance. It's not the quantity of puzzlers that hurts WiiWare, it's the quality. Don't misinterpret me, I'd love to see some platformers, but genre shouldn't matter, quality should. If I can find out what this game is about, I just might enjoy it. "Maybe this will help make up for the lack of World of Goo." It doesn't have to, you can buy this and World of Goo together (or Plattchen in Europe ) with only one 2000 points card!